Migration Assistant copies all of your files to your new Mac so that you don't have to do it manually. If your new Mac is using OS X Mountain Lion or earlier, follow the Mountain Lion migration steps instead. If you're moving content to a MacBook (Retina, 12-inch, Early 2015) or later, follow the MacBook migration steps instead. Install all available Apple software updates on both Mac computers. Your old Mac needs OS X Snow Leopard v10.6.8 or later. You should also install any third-party software updates on your old Mac. Make sure that your old Mac has a Computer Name: choose System Preferences from the Apple menu, click Sharing, then check the Computer Name field. If you're moving files to or from a Mac notebook computer, make sure that the computer is connected to AC power. Or connect your new Mac to a Time Capsule or external drive that has a Time Machine backup of your old Mac. If you're using a FireWire cable to connect the computers, start up your old Mac in target disk mode. If you're using a Thunderbolt cable to connect them, and your old Mac is using OS X Mountain Lion v10.8 or earlier, start up your old Mac in target disk mode. In all other cases, start up your old Mac normally. 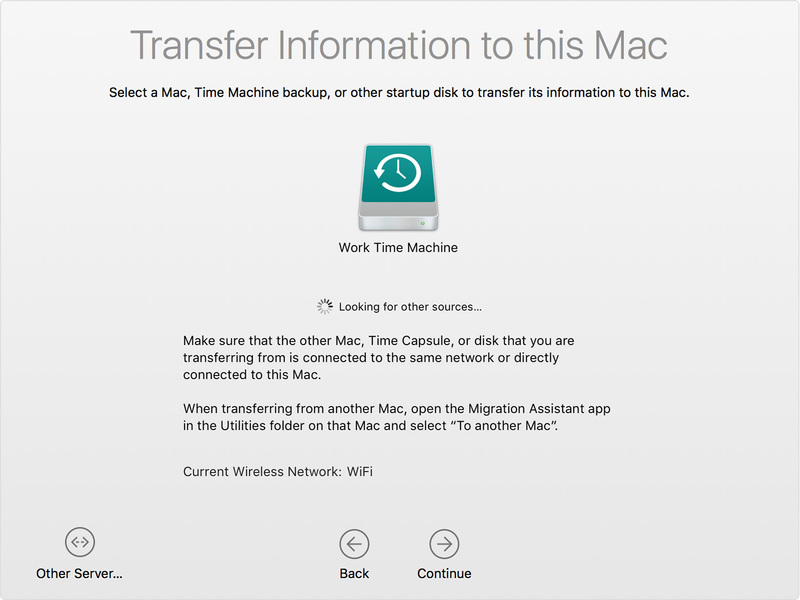 If you started in target disk mode or are migrating from a Time Machine backup, skip these steps. If you're migrating from a Time Machine backup, you might be asked to enter a password for the backup or Time Capsule. You should then see a list of backups organized by date and time. Choose the backup that you want to use, then click Continue. 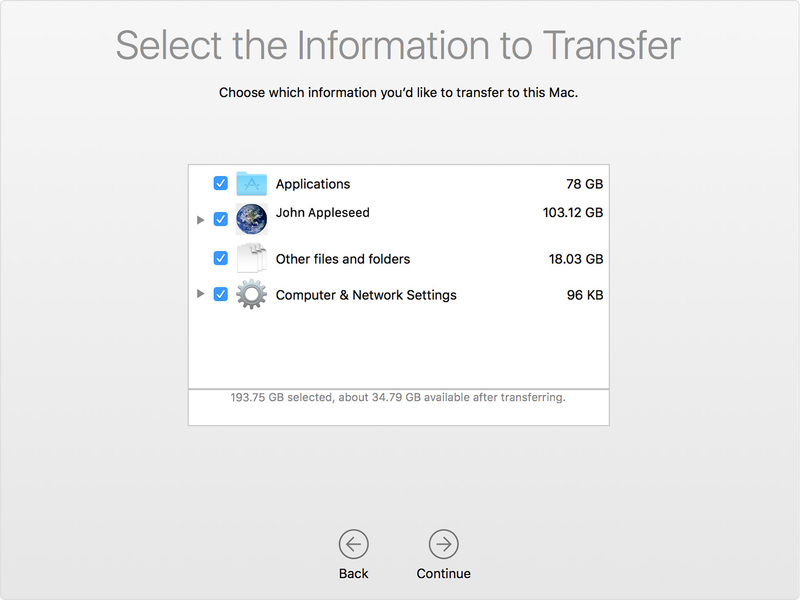 Select the information to transfer, then click Continue to start the transfer. If you have a lot of content, the transfer might take several hours to finish. 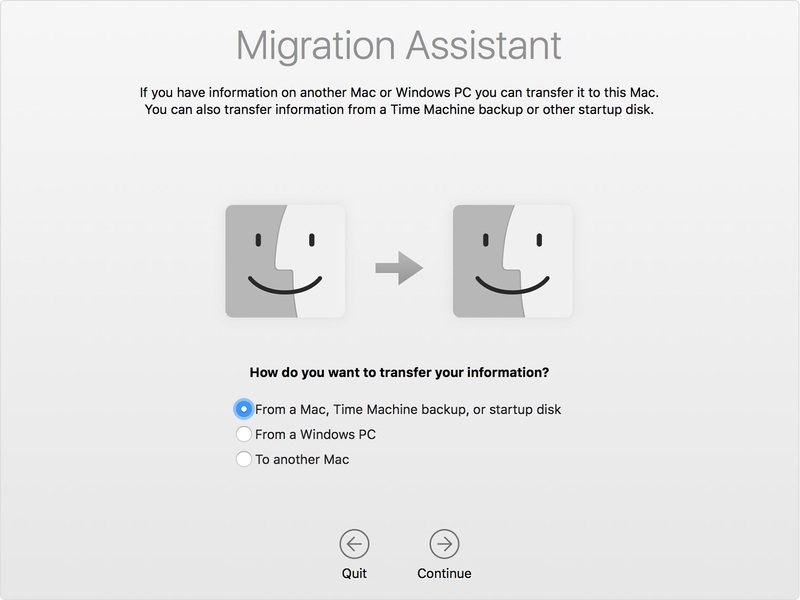 If you're transferring information from a Mac that is using OS X Server, Migration Assistant requires all items to remain selected. In this example, John Appleseed is an OS X user account. If you transfer an account that has the same name as an account on your new Mac, you're asked to rename the old account or replace the one on your new Mac. If you rename, the old account appears as a separate user on your new Mac, with a separate home folder and login. If you replace, the old account overwrites the account on your new Mac, including everything in its home folder.